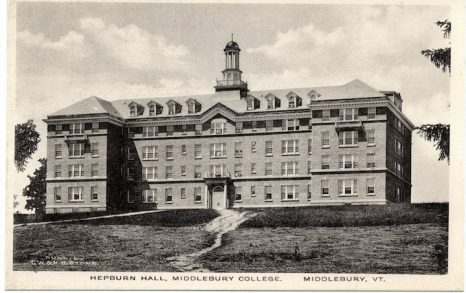 Middlebury's first fireproof dormitory, Hepburn Hall (1914–16), was the gift of A. Barton Hepburn Class of 1871. The design of Rossiter and Muller of New York City, this dominating structure is finely proportioned and academically more correct than the more vigorous McCullough and Voter Hall. True to its times, it is much larger in scale than such Georgian prototypes as those at William and Mary and Harvard Yard. The flavor is much more that of the Harvard houses of the 1920s. In material, however, Hepburn departed from the style. The donor had specified his favorite yellow brick! After his death the building was painted gray in an attempt to relate it more closely with the general vocabulary of the campus. The former dining room of the hall has come to be known popularly as the "Hepburn Zoo"—not because of the eating habits of the students, but because it was adorned with Hepburn's collection of hunting trophies. The "Zoo" is often used as a workshop theatre for student productions.